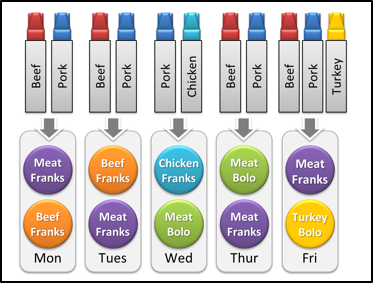 The Optimal Meat Formulation enables processed meat manufacturers to reduce materials costs and improve materials management by optimizing materials management decisions through all phases of formulation. The result is measurable savings of typically 5-10%, often much more, of materials cost. Optimal empowers users with Decision Optimization technology so they can achieve optimized performance. Think of Optimal as a GPS for decision makers: Give Optimal information including what you want to know; Opt-It! ; and, back comes the optimized solution. 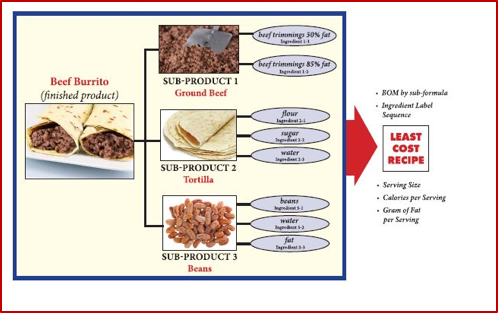 Optimal Meat Formulation, in each phase of formulation, enables generating incremental savings while insuring compliance with quality and regulatory standards. Procurement Planning considers multiple vendors, multiple ingredient prices, and truckload quantities to optimally formulate the purchase of raw materials products over multiple days, even weeks or months. Optimize where you spend your money! Production Planning optimally allocates materials inventory to production periods considering production requirements by product by period and the availability and expiration dates of materials. Avoid shortages and to utilize excess inventory materials with minimum penalties. Lot Allocation optimally sequences individual lots of materials to forthcoming batches based on lot available or expiration date. Generate a materials usage plan by batch for the day to insure the materials availability and optimizing the use of long and short materials, then execute batch by batch. Single Product enables batch assembly and correction, thus complying with all quality and regulatory requirements. This is the last chance to optimize the use of both expensive and inexpensive ingredient components (e.g., protein and water). Single product is also used for research and development. Multi-Site Procurement adds to Procurement Planning the optimization of multiple sites. Optimal (Web) is cloud based thus facilitating rapid deployment and support, eliminating most IT support costs, and enabling regular, non-disruptive updates. The Optimal interface includes powerful data import/export features to accelerate database construction. The Optimal API provides automated data exchange and optimization for tight connectivity with ERP systems. 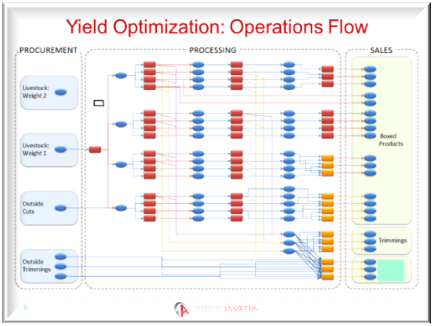 Optimal Meat Yield Optimization enables meat packers and processors to reduce costs and increase financial yields by optimizing in a single computation the integrated sales, procurement and production problem for maximum profit. The result is measurable profit improvement of typically 5-10%, often much more, of revenue. Sales Planning optimally determines the best mix of items to sell at what quantities and prices by forecast period (day, week, etc.) to maximize profit. Procurement Planning optimally determines the best mix of various profiles of livestock and other materials to meet sales requirements at the lowest cost. 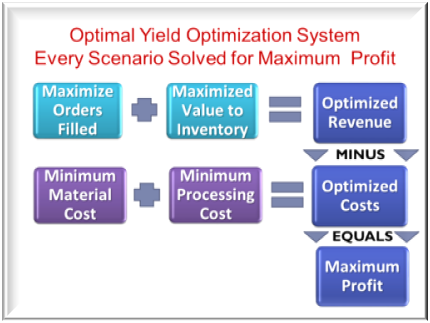 Inventory Forecasting (available-to-sell) optimally determines the maximum-profit sales items to sell at what quantities and prices to complement existing orders. Production Planning optimally determines production execution by processing step to meet production requirements with fixed materials to process and orders to ship. Optimal Food Product Development enables food product development professional to reduce product costs and accelerate the product development process by generating optimized recipes to specifications defined by the user. The user does the creative thinking; Optimal does the math! 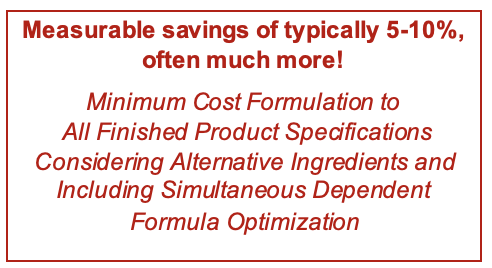 Optimal uses its powerful optimization technology to generate the single least cost formulation to the formula specifications entered by the user. Measurable Savings of typically 5-10%, of materials cost.